The other day I had this idea, what if I were to take all the concepts I write, speak, and consult about and turn them into a concept map. That might help me explain how things like messaging, unit of work, and exception management work together and why. It also shouldn’t be too much work. Or so I thought. I tried to keep the file big enough to be quite readable but small enough to be sent directly via email (less than 600KB). The coming release is going to be a more interactive environment where you’ll be able to click on each concept for more information, see what else its linked to, and get links to online resources. 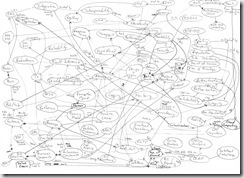 This is quite an undertaking so if this is something that you want to see move forward, please leave a comment or maybe link to it from your blog. It’s hard for me to know what really connects with you and what you just delete from your reader so any feedback is really appreciated. Don’t publish this comment if you wish. I’m wondering why did you distinguished S+S from SaaS. I personally don’t see any difference except from a marketing perspective. I like the idea, but from your picture I am not able to get an overview. 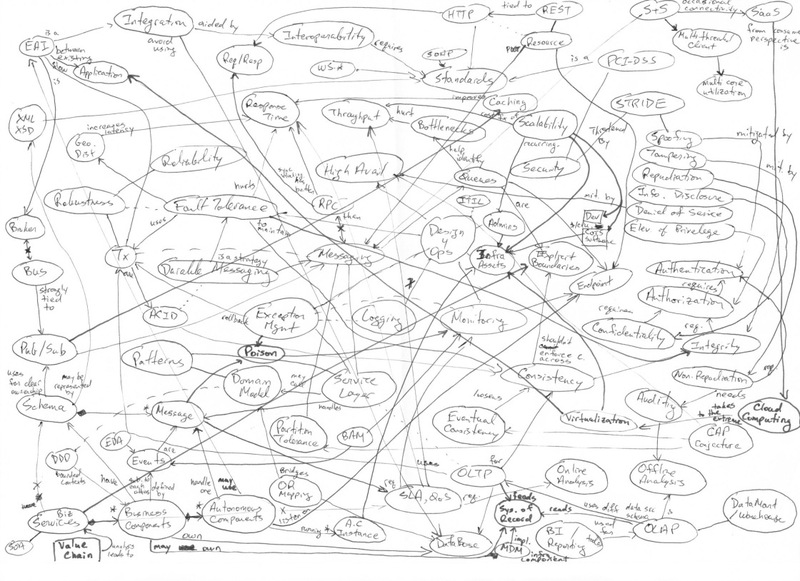 I’ve always though that wikipedia should have a kind of “mind map” view, this is exactly what you’re proposing/showing. I think the map should have a notion of importance. As you said “SOA is a tiny circle”…it should be more like a large town (using location map analogy) and why not having “Stive” a town with suburbs as spoofing, repudiation… etc. So, yes, excellent idea, go ahead, and just highlight what are the strong concepts (large towns) and the main axes/relationships (highways)…just to clean it up. It’s great for a 1st draft, however the diagram seems to emcompass a variety of “lenses”. for example there are conceptual temrs like Robustness, High Availability and ACID which describe the effects of a well designed system. Then you have events. most notably are the Spoofing, Tampering, DoS. Then there are infrastructure nodes like Database, HTTP, RPC. there is an underlying picture you want to express. the picture can be viewed through any of these lenses, but trying to view the picture through all the lenses makes things fuzzy. Another thought is what’s your target audience. I still concider myself a novice at DDD and enterprise archicture. So just understanding the concepts and basic examples of messaging, uow, adaptive domain model provide tons of euraka moments. However details like spoofing, SaaS, multicore initialization, etc are just beyond me (or not applicable). Then you have the more advanced audience who know about messaging, uow, and adaptive domain models. They want the details about preventing spoofing, how to utilize SaaS and multicore initialization, everying else is considered common knowledge. 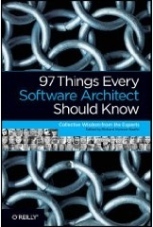 again this is great material for a brain dump of the complexity of enterprise level systems. I think it now needs some refinement into what you want to communicate, and to whom. Does a picture with a thousand words worth a million words? Jesse – LOL! That’s the reason why I didn’t go get another page and moved to a more structure tool (EA). I think something like this would be invaluable. I think this particular area of technology is going to become very important for more and more people very quickly, and a nice road-map would be hugely useful. Also powerful would be if it were delivered in a wiki-style, collaborative environment so that it could be discussed and evolved by the community at large. If you don’t object, I will use it to explain why iMapping, an alternative visual mapping approach, that I developped, has some advantages.